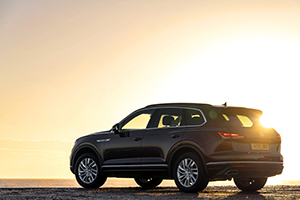 Volkswagen has increased the engine choice for Touareg customers, with the introduction of a new, powerful 340 PS 3.0-litre V6 TSI engine to the premium class SUV’s range, in addition to the capable 231 PS and 286 PS TDI diesel units already on offer. The latest member of Volkswagen’s growing range of SUVs brings even more choice for Touareg customers, adding a third powertrain to the model’s previous line-up of 3.0-litre V6 TDI engines, with all three units available in SEL, R-Line and R-Line tech specs. This new petrol engine delivers its peak 340 PS power output between 5,300 and 6,400 rpm, with 450 Nm of torque produced between 1,340 rpm – just above idle – and 5,300 rpm. Just like the diesel-powered Touaregs, the petrol engine’s power is delivered to all four wheels via Volkswagen’s 4MOTION all-wheel drive system, with a limited slip differential combining with the system to give the Touareg its sharp road handling. The Touareg 3.0 V6 TSI 340 PS reaches 62 mph from a standstill in 5.9 seconds before going on to a top speed of 155 mph where permitted, making it the fastest variant in the Touareg range. Towing weights remain unchanged over the diesel models, with a maximum weight of 3,500 kg possible for all three powertrains, while the 340 PS Touareg itself is a full 50 kg lighter than its diesel counterparts, at 2,020 kg. On the combined cycle, the model returns 31.7 mpg, with CO2 emissions of 203 g/km1. Orders open today for the first petrol variant of the third-generation Touareg, with first cars expected to arrive in the UK in April. Product Manager Brian Luckie said: “The addition of a powerful petrol engine to the Touareg range now gives customers three options – the choice between one petrol and two diesel units ensures that there’s a Touareg for all customers.